Broomberg and Chanarin will present a new 12 minute film, The Bureaucracy of Angels, within King’s Cross Station for Art on the Underground, Transport for London’s public art programme, in September 2017. The Bureaucracy of Angels records the demolition of 100 migrant boats in Sicily in the winter of 2016. These boats arrived laden with refugees from North Africa and while their human cargo were either sent home or absorbed into the asylum system, the boats themselves were never returned to their owners, lying beached on the concrete forecourt of Porto Pozallo in Sicily. Broomberg and Chanarin have a long history of working in war torn countries and areas of conflict. Their research on themes of migration and movements of people lead them naturally to the current migration crisis. The artists visited Sicily a number of times where they were able to explore the area where migrants arrive from perilous journeys across the Mediterranean. They filmed the rescue missions by the Migrant Offshore Aid Station (MOAS) foundation off the coast of Libya as well as the destruction of the boats left to decay once the migrant journeys have been made, in a vast shipping grave yard in Porto Pozallo in Sicily. 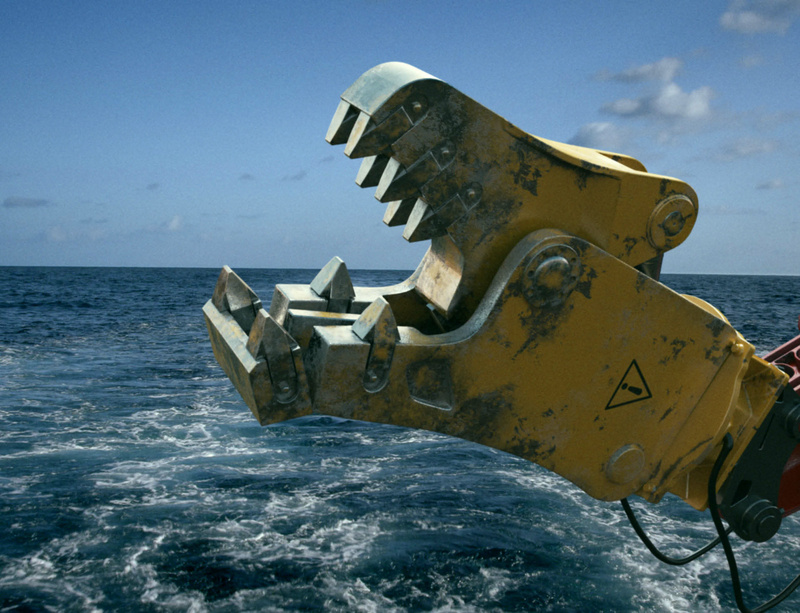 The film is narrated by the hydraulic jaws of the digger charged with the job of destroying these boats, tearing them apart into their constituent parts of timber and metal, a process that took forty days to complete. The digger appears in the narrow corridors of the boat yard, on the open sea and in the midst of a rescue operation off the coast of Libya, as a Cantastoria or ‘singing storyteller’, recounting the Sicilian ballad Terra ca nun senti. The song speaks of the fear and pain associated with immigration to and from Europe’s most southerly territory over the last 150 years. The commission will be shown within Kings Cross St Pancras Underground station in a location close to the exit of the Eurostar. The space was chosen for its link as a passageway between the UK and greater Europe, embedding the work within the station and enabling it to be shown to a transient audience.